Move over, pumpkin spice. As much as I do appreciate you, there’s another delicious autumn aroma that doesn’t get nearly enough attention. Enter, apple butter. Slow roasted apple butter was a local tradition growing up in Pennsylvania, and the incredible scent takes me right back to the bonfire. For the indoor chef, check out the NYT’s recipe to make this deliciousness right on your stove top, oven, or slow cooker. Fill your home with natural fall fragrance, and enjoy your apple butter spread over a warm scone, muffin, waffle, or toast. I love little touches of copper for fall. 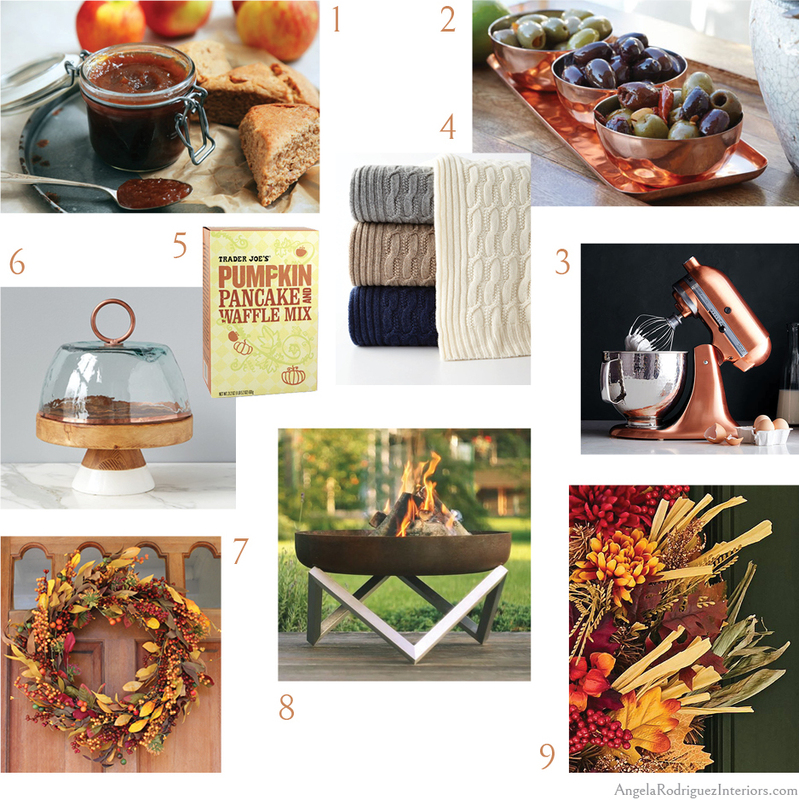 A copper tray and bowl set is perfect for autumn entertaining, and can transition nicely right into every holiday celebration from now through New Year’s Eve. Speaking of copper, how pretty and inspiring is this KitchenAid mixer in copper? See how surprisingly well it pairs with all of the silver tone kitchen finishes you likely already have. Three words: cable knit cashmere. A cashmere throw is great for Fall (even in Florida), and brings an extra touch of seasonal softness for cozy evenings by the fire (or TV). All baking-from-scratch recipes and appliances notwithstanding, a real favorite in my house is Trader Joe’s Pumpkin Pancake and Waffle mix. It’s so easy to wake up on a Saturday morning and mix up a big batch for everyone, and the blend of pumpkin, ginger, cinnamon, and nutmeg just smells so good and autumn-y. There’s also a gluten-free version if that’s your speed, though I haven’t tried it. Tip: if you’re not near a Trader Joes, you can find this mix on Amazon! If you do decide to bake some delicious fall treats (please bring me some, and) consider using a chic pedestal and cloche pair to display them. To purchase this one, contact us. Welcome family, friends, and neighbors with an autumn door wreath like this one. Fall color wreaths really pop on deep colored, or wood stained front doors. So if yours fits this description, why not give it a try! When the nights get cool enough, a wood burning fire is definitely one of my fall favorites. Your personal style doesn’t need to be rustic to enjoy one, though. This stylish, steel firepit will work well with more contemporary outdoor settings. Fall style is all about texture. Check local farmer’s markets, or home and craft stores for natural elements and dried foliage to make your own decor, or shop premade designer arrangements from Balsam Hill for door, mantel, tabletop, and more. Welcome, Amarin, New ARI Team Member!